India has a booming population. According to the 2012 census results, the country has more than 1.27 billion people and the number is rising. However, more than 60 percent of the population is below the poverty line with no direct access to shelter, food and income. This percentage includes urban and rural homelessness. As India continues to expand its economy, most researchers doubt the capacity of the country to care for its poor and homeless. Due to rising land costs, expensive labor, and raw material costs, an urban home can easily cost anywhere from Rs 20,00,000 to about Rs 2 crores, states Integbuild. This price range is expensive and most middle-class families opt for long-term loans to purchase their dream homes. However, for the lower middle class and poverty line class, home loans are also unavailable due to unemployment, no mortgageable assets, and poor credit. At present, Business Today estimates that 26.5 million housing units are required to house people in India. The good news is that prefab or modular housing is now available in India and it is affordable to almost 90 percent of the population, according to Rajan-c-mathew.blogspot.com. Modular housing is not new to India. The first units came up in the Hindustan Housing Factory set up by the first Prime Minister of India, Pandit Jawaharlal Nehru. The units were set up to provide affordable housing for refugees from West Pakistan in the late 1950s. The company was a leading manufacturer of housing solutions for families from low-income groups and they did a very good job. However, after a few years, the company diversified into architectural solutions for commercial projects and the prefab division was downgraded. However, commercial construction had always been using prefab components to speed up the construction schedule. For example, builders commonly use prefab or modular wall panels, ceilings, plasterboards, etc to set up hospitals, offices, and malls quickly. Usually, these prefabricated building solutions consisted of pre-engineered units built according to computer specifications and then assembled on the construction site to finish the building faster. In 2010, the Indian Government has made it a goal to provide accommodation for all its citizens by 2020 and this led to an increased interest in prefab architecture. In 2012, Synergy Thrislington set up the first 100 percent prefab commercial 10-storey building in Mohali. The building was completed in 48 hours and now forms the headquarters for the Synergy Thrislington Company. Now modular residential units are being investigated as a great and affordable housing option for India’s vast middle-class. Residential Prefab or Modular Homes: A Good Idea? Not many builder companies offer prefab homes in India. The actual term ‘modular’ or ‘prefab’ will also vary from builder to builder. For example, modular homes by Unitech Group involve a pre-approved concrete structure and foundation manufactured in a factory and then assembled on site. Buyers have the option of investing in land and then setting up a house according to pre-approved designs. However, this is still too expensive for India’s vast middle class. A far better option would be houses that are completely modular or prefab in texture with state-of-the-art technology and materials. The process is simple and involves the use of CAD-CAM technology to design a steel framework. The individual wall panels, windows, doors and ceilings are made according to the design technology of specific materials and then shipped to the construction site. Assembly takes place on-site and a high-quality home may be set up in anywhere from 48-hours to six weeks. The process is cheaper than concrete construction and results in lightweight but durable homes. There is no need for ancillary activities like plastering, wiring, or plumbing, as all this is done during the casting stage itself. With the right prefab homes, it is possible to have a home up and running in an affordable price range and within a short period of time, states Ecochunk. What To Look For In a Modular Home? For the Indian market, investing in a modular home may seem like a dangerous risk. What if the home blows away during hurricanes? Can you do renovations? How much time will it take to build and how long will it last? These are legitimate concerns and it can help if you do as much research as possible before you invest in a real time home or a modular home. As we’ve already stated, the actual description of a modular home will vary from builder to builder. It would be a good idea to find out exactly what the builder means in the form of modular housing and how much money it will cost you in the end. If you still aren’t sure about modular housing, then stick to traditional bank-approved modular housing for your dream home, recommends Hindustantimes. You are will get loan approval and a wide variety of choices. Where I live land and development charges are so expensive that I think the more frugal option would be a small older home. If we were to move out to the country a modular home would definitely be something we would look into. That sounds like a good idea to offer an affordable and quick building solution. In Guatemala, people rely more on cheap labor and build a home slowly as they get money to build more. So the house would have just a main room first, then they would build a second room, then a third, maybe even a second level. It allows them to build a house without a mortgage. 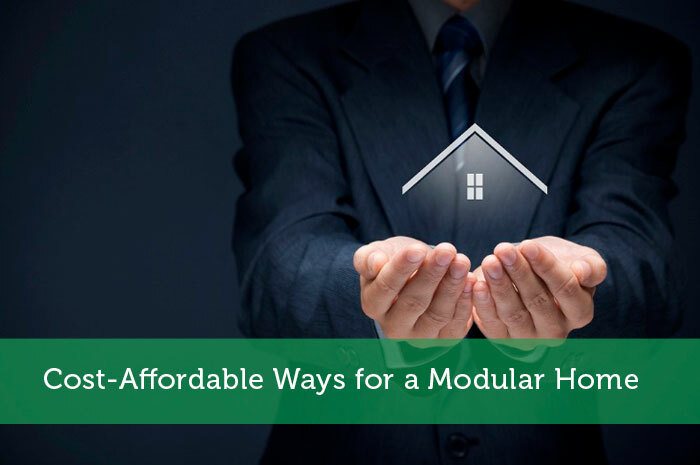 I had no idea that there were so many options when it comes to getting a modular home. It is so great that there are inexpensive ways to get a home like this. In fact, I think that a modular home would be the perfect place to go after my husband and I finish raising the kids. Hello, and thank you very much for having shared this information on the current market for buying homes. There are a lot of things that change with time for home buyers, and it’s important to be informed of the changing news and info regularly. I think it’s important to know what’s going on in the home market when you are both looking to buy or sell your home. I like the idea of modular homes, but I like the idea of safety and longevity a little bit more! Your tip about considering renovations in the future is a good one, too! That’s extremely important. Are most modular homes generally a little bit cheaper than other homes? I think it is crazy how there are so many different options to choose from purchasing a modular home. You said that modular homes are usually cheaper then other homes. But, how much cheaper are they? Would it be worth my time and effort in purchasing one? Thanks for posting this! I’m looking for a place to stay, but there’s very little affordable housing available. It seems like a modular home may be my best bet. Your advice for what to look for in a modular home will help me find one that I’ll feel comfortable living in. Asking if I can do renovations on a modular house seems like a good question to ask. I have a lot of ideas for what I want my perfect living space to look like, and it seems like being able to renovate a modular home is just what I should do to make it feel more like home. Thanks for the information on what to look for in a modular home. I will definitely be sure to find a place that allows renovations to be done, like you mentioned. Do you have any other tips for me? I think that modular and prefabricated homes are a great way to provide affordable housing. It is amazing that a 10 story building was built in two days using this same technique. At that rate, they could build and entire neighborhood in a week! I would be interested in seeing a project like that be completed. I need a home that is wheelchair/ADA compliant. Would a modular home on a prefab foundation be a great route to go? Basically, I need a home with an open theme that is also one level. I can’t do stairs or banging into walls in any way. Thanks for the tips. I do like how a modular home is so customizable. I have been looking at building a new home and this seems like the best option for my property. I know that the foundation has to be set perfect but other than-than that I think it is a very simple way to get a new home put on my property.